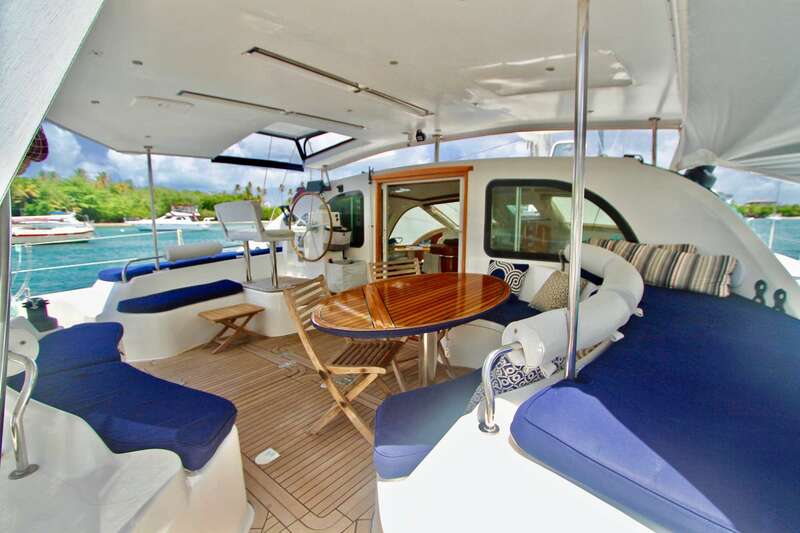 ISOLABLUE, a 49-foot Privilege sailing catamaran, is a masterful build. She is a high-end cruiser designed for luxury living at sea. 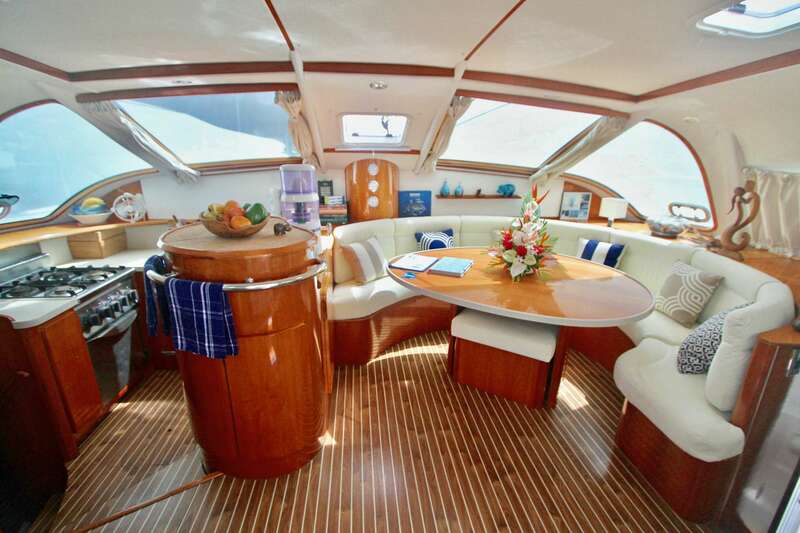 This deluxe yacht is fully-equipped for transoceanic adventures in complete autonomy. State-of-the-art equipment includes: brand new air conditioner chiller inverter, generator, water maker, electric winches, battery chargers/inverter, solar panels, refrigerator, freezer, dive compressor and more. Please note the crew makes purified drinking water. The design brief for ISOLABLUE demanded luxury interior and exterior spaces that are equally practical and comfortable. Interiors are beautifully executed with elegant built-ins, stylish upholstery and high-quality joinery and finishes. The salon and dining area are spacious and flooded with daylight. Guest relax in comfort on plush, u-shaped seating around the oval dining table. The guest cabins are roomy and well-ventilated. Each is equipped with an individually controlled digital thermostat to ensure the perfect temperature. The large beds measure 5.2 x 6.6 ft and are bedecked in fine linens. 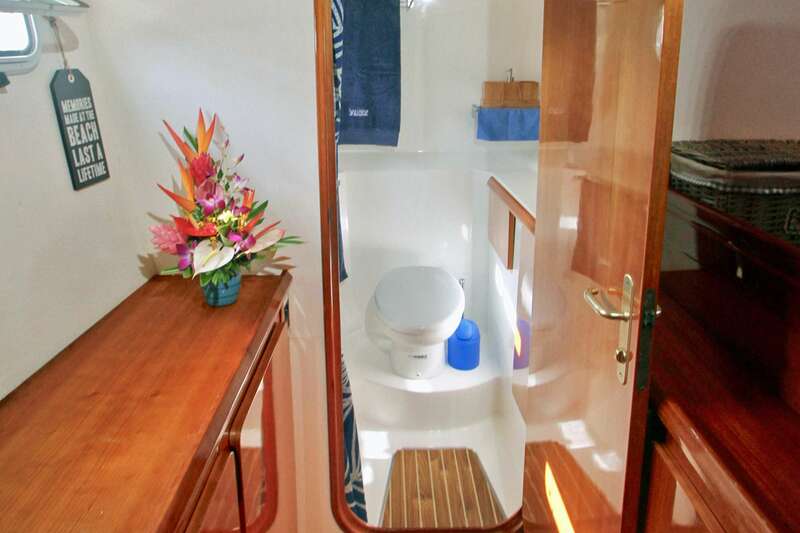 Three cabins have a private shower and toilet. Accommodations are perfect for a romantic getaway, friends, or a family. If required the aft cabin port side can convert to two single beds. Guests enjoy real comfort, great privacy, generous social spaces and the feeling of being at home. The large cockpit is the preferred spot for dining al fresco with magnificent views. Easy access to wide transoms makes launching water toys and diving into the Caribbean Sea effortless fun, even for children. 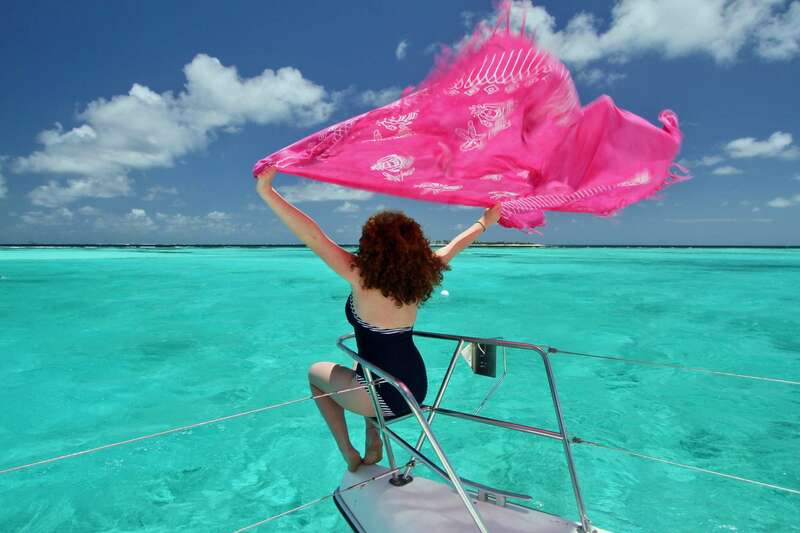 Snorkeling or diving right off the yacht is spectacular. Captain Laurent is a licensed PADI instructor and Chef Astrid is a licensed PADI Divemaster. They offer one "discover scuba diving" or a dive per person for a minimum stay of seven nights. 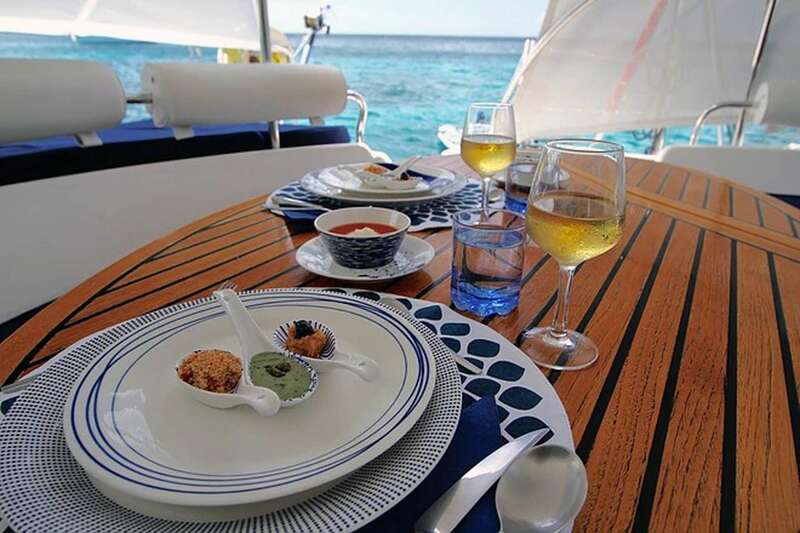 Award-winning Chef Astrid took first place at the 2018 Grenada Charter Yacht Show Culinary Competition. ISOLABLUE is a luxury floating villa that offers the best of living at sea. The highly professional crew are eager to share the magic of the islands with you. Charter this beautiful catamaran to sail with your guests in style, safety and comfort on a voyage through the enchanting Caribbean. Isolablue is best suited to 2 adults and 2 children, or 4 adults. In this case, each cabin has its own head. Otherwise, for 6 pax, Isolablue is best suited to 4 adults and 2 children as one head will be shared between parents and children. 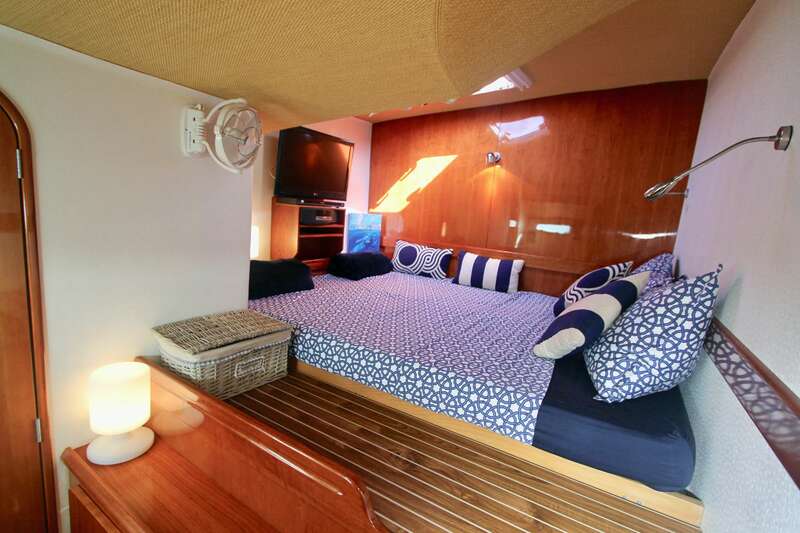 ONE COUPLE: Starboard FWD cabin, with 5.2 ft x 6.5 ft bed with ensuite bathroom, plus 2nd large shower, and a TV. 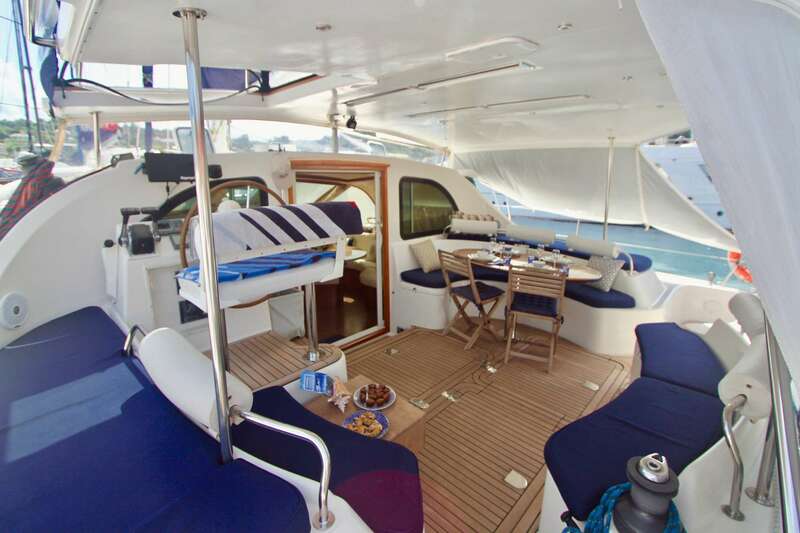 The starboard AFT cabin can be used as a dressing room – using the complete starboard hull. TWO COUPLES (friends): the two FWD cabins with 5.2 ft x 6.5 ft beds, ensuite bathroom, and a TV. 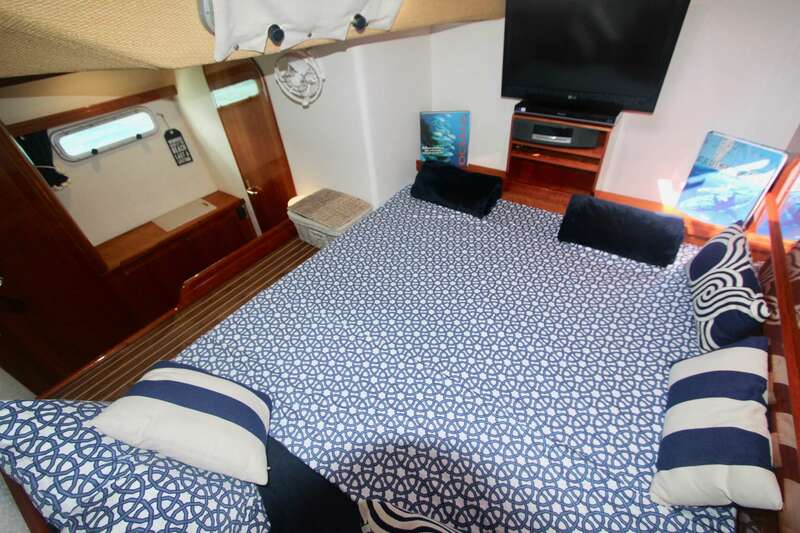 ONE COUPLE & 2 OLDER CHILDREN: the starboard FWD cabin with 5.2 ft x 6.5 ft bed with ensuite bathroom, 2nd large shower, and a TV, for the parents (or the port board FWD cabin) and the port board AFT cabin for the teens (with separated beds - 2.6ft x 6.5ft) with ensuite bathroom. Salon and cabin headroom is 6'.4"
Fully centralized air conditioner chiller inverter so our guests will be able to regulate their individual cabin temperature with a Digital Thermostat.